A railway to the top of Snowdon was first proposed in 1869 by Sir Richard Moon, Chairman of the London & North Western Railway, after a branch line from Bangor to Llanberis had been completed. Initial Parliamentary Bills were met with stiff opposition from the landowner George William Duff Assheton-Smith. Plans to promote a railway from Porthmadog to the summit of Snowdon, and the opening of a narrow-gauge railway to Ryd Ddu on Snowdon’s southwest flank in 1881, led to a significant loss of trade to the community of Llanberis. All this gave Assheton-Smith’s agent, Captain N.P.Stewart, concern enough to argue for a railway to the summit from Llanberis. Assheton-Smith eventually withdrew his objections and Sir Richard got his way. 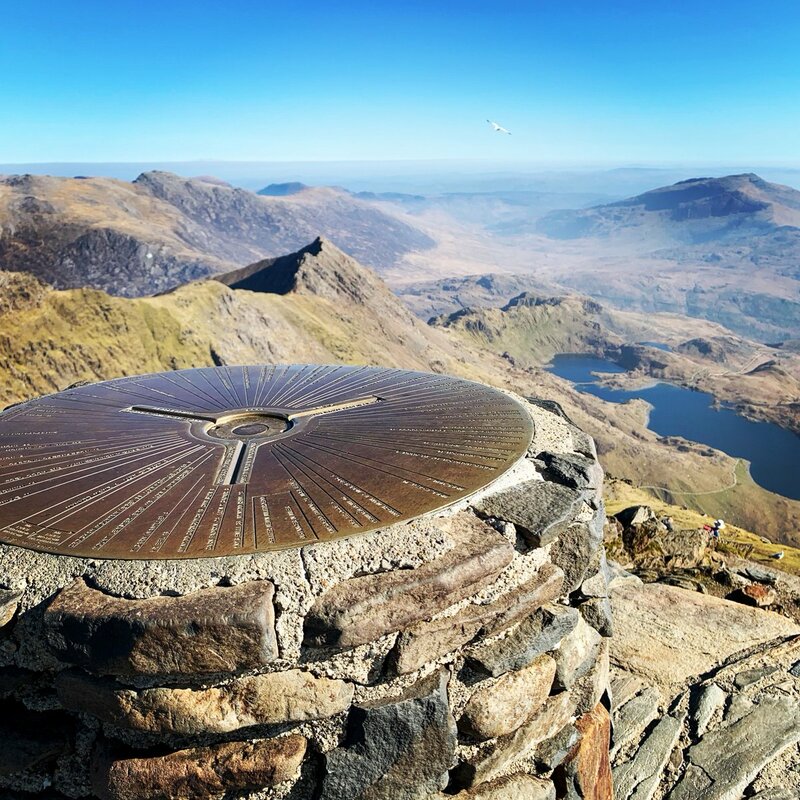 In 1894 the Snowdon Mountain Tramroad and Hotels Company Ltd. was formed, and the scene was set for one of the world’s great feats of engineering to begin. Snowdon Mountain Railway was constructed between December 1894, when the first sod was cut by Enid Assheton-Smith (after whom locomotive No 2 was named), and February 1896, at a total cost of £63,800 (equivalent to £6,775,000 in 2016). 150 men with picks, shovels and dynamite laid almost eight kilometres of track up the mountain – all in fourteen months. The technology for safely transporting carriages of people up and down a mountainside had existed in Switzerland for some time, so that was where the newly-formed Snowdon Mountain Tramroad and Hotels Company Ltd. went. They purchased five Swiss steam locomotives — L.A.D.A.S, Enid, Wyddfa, Snowdon and Moel Siabod – three of which are still in service today. Three more steam locomotives were built in Switzerland — Padarn, Ralph and Eryri — along with two more carriages. All of the railway's steam locomotives were built by the Swiss Locomotive & Manufacturing Co. of Winterhur at a cost of £1,525 each (which would have the equivalent purchasing power of around £120,000 today). In 1924, the Snowdon Mountain Tramroad and Hotels Company Ltd sold the Royal Victoria Hotel and formed as Snowdon Mountain Railway. It’s not really known when the first building was erected on the summit, but by 1820 there definitely was one. A few years later you could even buy a cup of tea up there, and by 1847 there was a small community of wooden huts clustered around the cairn. By 1930 these had deteriorated to such an extent that the decision was taken to build one multi-purpose building instead. This was designed by Sir Clough Williams- Ellis, better known for the village of Portmeirion, brought to the public’s awareness as ‘The Village’ from the 1960s TV show The Prisoner. During the 50's and 60's the four original locomotives were sent to Hunslet to be overhauled, No.2 in 1958, No.5 in 1959, No.3 in 1960 and No.4 in 1963, and the original open carriages were remodelled so that they became enclosed, in an attempt to better protect passengers from the elements. Ninety years after the original steam locomotives were purchased, Snowdon Mountain Railway Co. Ltd. took delivery of two diesel locomotives Ninian and Yeti costing £250,000 each. Equipped with turbocharged 320 horsepower Rolls Royce engines they proved so efficient and reliable that two more were acquired, Peris and George in 1991 and 1992, and in 1995 three diesel-electric railcars were added to the fleet. The Clough Williams-Ellis building of the 1930’s was no longer able to withstand the challenging mountain conditions and became unfit for the needs of visitors to the summit. In 1992 the Snowdonia National Park Authority agreed to replace the summit building and station facilities with a new visitor centre called Hafod Eryri. A competition to design a replacement building, commissioned by the Snowdonia National Park Authority was won by Ray Hole Architects and construction began in 2006. Today’s £8.3m building, Hafod Eryri, was officially opened to the public by First Minister Rhodri Morgan in 2009. New railway carriages were put into service between 2013 and 2014. Four contemporary carriages built by Garmendale Engineering for use with diesel locomotives were introduced, along with two new heritage carriages the “Snowdon Lily” and “The Mountain Goat”. Pushed by original Swiss steam locomotives and built on the original chassis and bogeys, the heritage carriages are accurate re-constructions of the carriages of 1896. The railway celebrated its 120th anniversary in 2016. A Victorian themed weekend was held at Llanberis station during September, with local Welsh food and drink stalls, steam traction engines, swing boats, Punch and Judy and a variety of entertainment throughout the 3-day event. After almost 20 years out of service, steam locomotive no.5 Moel Siabod returned to service after a comprehensive refit. The railways employed its first ever female fireman to work on-board the steam locos.